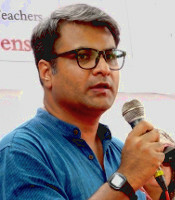 We thank teachers for their overwhelming support to elect Rajib Ray to the EC and the team of Renu Bala, Rakesh Kumar, Sheo Dutt and Amitava Chakraborty to the AC! 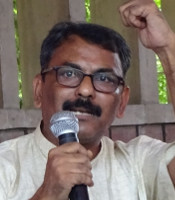 On February 1, 2011, Vice-Chancellor Dinesh Singh met teacher representatives from all the colleges in an apparent effort to seek feedback on problems plaguing the university. This followed the interaction he had with undergraduate students from various colleges the previous day. These were meant to initiate a dialogue with two crucial ‘stake-holders’, teachers and students, whom the University administration has long forgotten. Though the VC chose to use these events to announce ambitious plans about attaining ‘global standards’, both the students as well as the teachers drew his attention to the issues of teaching-learning processes that need to be immediately addressed. Well-attended by students and teachers on their respective days, both these events put the University administration on the defensive when the session was opened for questions. The VC and other university officials had no answer to the probing queries made by students and teachers about various issues. The VC was cornered by the repeated questions posed by teachers about the need to impose an ill-conceived semester system at the undergraduate level. 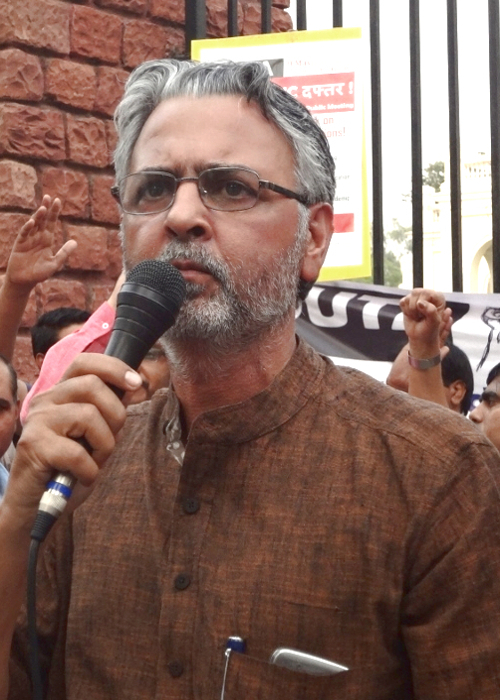 He was urged to take teachers’ considered opinion to the MHRD instead of imposing its diktat. Many science teachers across disciplines expressed their dismay at the poor structure and content of the 13 science courses running in semester mode in 2010-11 which have been prepared in utter disregard of procedures. Many English teachers expressed their apprehension that the undue haste in imposing the semester would not only compromise the academic rigour of their discipline but would also ensure a manifold increase in failure and drop-out rates. Even many students very cogently argued that the semester system would make it impossible for them to pursue their interests in sports and other co-curricular activities, thus denying them any holistic development of their personality. Everyone underlined the ‘trust deficit’ between the University authorities and the teachers/students owing to the highhandedness shown by the authorities in tackling any issue and repeated violation of laid down procedures. The VC and his team members neither answered any question nor provided any assurance. The DTF welcomed this gesture of the new VC to initiate a dialogue with teachers and students as a step to bring all sections of the university together. We sincerely hoped that this marked a beginning to reverse the trend of autocratic administration. However, it appears that hasty moves are afoot to bring about semesterisation of other courses in complete disregard for the issues raised during these interactions. 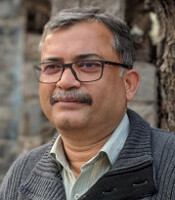 Any such move to sidestep substantive critique should be resisted as it neither attempts a consensus about the academic merits and demerits of semesterisation nor does it deliberate upon the quality of and equal access to higher education. We may recall that the protracted collective struggle on the issue was based on a responsible and academic critique made by teachers in Staff Councils, Staff Associations and Department meetings. This critique was disregarded by bypassing longstanding academic practices such as the General Body of all teachers of a subject and even the statutory bodies to push through semesterisation in science courses. All of us who value discussion, argument and critical scrutiny as integral to sound academic decisions must stand up against the repetition of such actions. Neither has the decision to introduce semester system at the undergraduate level been taken with due application of mind since the AC has yet to debate and answer detailed critical opinion expressed in the feedback it had sought nor has the framework for course design proposed by the Empowered Committee been debated in the Academic Council. There is absolutely no legal or moral basis for HoDs / Committees of Courses / General Bodies of Departments to succumb to this undemocratic and anti-academic pressure to make curricula and syllabi that will disrupt the teaching-learning process. No Vice Chancellor has the right to impose an academic framework on Departments in violation of legal procedures. The High Court order on the PIL directed teachers to teach in the semester system and take judicial recourse instead of resorting to strike action. The High Court order does not say that other courses must be semesterised and that teachers or their Associations, Departments, and Faculties must fall in line at any cost without regard for academic consequences. No court order restrains teachers from expressing their academic opinion and opposition, or from refusing to frame syllabi they consider inappropriate. We believe that it would be unwise for any Court to pass such orders. The very essence of a University would be destroyed if teachers do not stand up for their views. Nor should we accept that the semester system is a fait accompli and hence it is best to help prepare the best syllabi given the circumstances. Succumbing to such blackmail would not only defeat our principled opposition to the administration that acted without reason but also constitute a betrayal of students’ right to meaningful education. That semesterisation in the given system of undergraduate education in DU would lead to better education must first be demonstrated through due debate, arguments or answers. It should not and cannot be allowed to pass through by creating fear or confusion. Every teacher, every teachers’ organization and the DUTA has a responsibility to ensure that the University remains a place where opinion can be freely expressed and where academic decisions must be well considered and based on informed debate and discussion. The writ petition filed by the DUTA has been admitted and the PIL filed by Mr. M.R. Gupta has been disposed of. While disposing of the PIL, the High Court declared its earlier orders as final orders. The University has been directed to submit its reply within six weeks from 8.2.11, the writ will then come up for hearing on 28.4.11. The writ prays for quashing of the purported one-line decision of the AC on 5.6.2010 to introduce the semester system from 2010-11 on the ground, amongst others, that it lacked application of mind since the AC was not allowed to discuss the feedback it had sought following the debate in the AC on 7.10.08. The writ also prays for quashing the decision of the AC to approve the curricula for undergraduate science courses on 13.5.10 on the grounds that they were not framed through due process. Some Committees of Courses had rejected / not approved the curricula pushed through the Faculties; the VC made arbitrary rulings on procedural violations and stopped an academic debate when Deans and HoDs subjected both the semesterisaton proposal and the course design of 24 papers to critical scrutiny. The writ further prays for quashing the 13 undergraduate science courses since the necessary Ordinances providing for these courses have not been put in place by the EC till date and the University Court, Visitor, etc have not been apprised of the amendments. The writ has sought quashing of the decisions by the VC by misusing emergency powers to approve courses and amend Ordinances to push through semesterisation. The writ has specifically prayed for quashing of the letter written by the VC on 1.10.10 to all Deans and Heads to frame syllabi in accordance with the “stipulated 24 papers for an undergraduate degree” since no such stipulation has been made by the AC/EC and this is therefore not in the Ordinances. The writ has submitted to the court a summary of substantial arguments and concerns of teachers against the semester system at the undergraduate level. 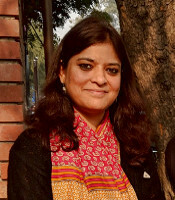 It has pointed out the arbitrary manner in which the University authorities pushed aside longstanding practices of debate on academic restructuring and vandalised the due functioning of statutory bodies to push through decisions without regard for the academic consequences and in violation of the Act, Statutes, Ordinances and Regulations of the University. The reprehensible Performance Based Appraisal System (PBAS) to quantify teaching and research has confirmed our fears that the MHRD/UGC, in collusion with the university authorities, are bent on shrinking promotional avenues for teachers. They want to compel teachers to deflect attention away from quality to quantity. This means a downgradation of the benefits of pay revision and of the quality of teaching and research. If the semester system in undergraduate courses is the first step towards the dismemberment and corporatisation of the University system, then the PBAS/API system marks the beginning of a system of differential pay-scales for teachers depending on the market-value of their disciplines. We need to create necessary pressure so that grievances and representations submitted to the UGC by teachers’ associations are addressed instead of languishing with the Anomalies Committee, which has evidently been created to disarm organised protest. 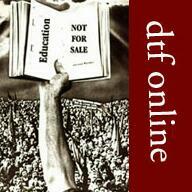 The DTF urges the DUTA leadership to take up in earnest the demand for the withdrawal of the PBAS. 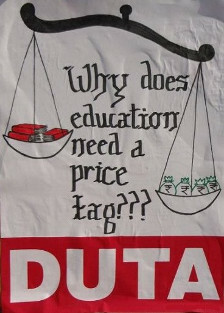 The DTF has time and again urged the University authorities to strictly implement the reservation policy for SC, ST, OBC and PH categories in teaching and administrative positions as clearly laid down in the UGC Guidelines 2006-07 in order to uphold the policy of affirmative action for the underprivileged sections of the society. The VC was urged to re-open the debate of desirability and feasibility of the semester system as a mode of undergraduate teaching at our University. His attention was drawn to the thirteen science courses in which the semester system was imposed this year. The delegation stressed upon the need to discuss the entire process afresh instead of making minor corrections in the syllabi. They pointed out that these courses have a fundamentally flawed structure which has led to reduced choices for the students and a decrease in the interdisciplinary content. They highlighted the need for mechanisms to ensure periodic review of policies. The delegation reiterated that recent academic reforms such as the semesterisation of M.A. and M.Sc. Courses, the guidelines for internal assessment, and the system of central evaluation await such review. Attention was also drawn to the tremendous pressure on existing infrastructure and manpower due to OBC expansion. It was urged that appropriate infrastructure be developed and appointments of teaching and non-teaching faculty be made on a priority basis. The team was also apprised of the anxiety in the teaching community today because of the system of quantification of teachers’ activities through the Performance Based Appraisal System (PBAS) which is utterly irrational and will lead to denial of promotions, making the profession unattractive for talent as it would encourage obsession with score building and fraudulent practices rather than commitment and quality, both in teaching and in research. The Vice Chancellor was urged to take up the issue of the PBAS with the UGC on a priority basis and help in its withdrawal. The urgent need to make the enquiry report on the Cobalt-60 incident public and to penalise those responsible for such criminal negligence. The guidelines for ad hoc appointments must be reviewed, since the provision of interview after every four months has rendered young teachers insecure and has adversely affected the students through frequent changes in teachers. The VC should take up with the UGC the issue of arbitrariness over NET so that exemptions announced earlier are continued. Clear guidelines are needed to end manipulation and ensure proper implementation of the reservation rosters in the University and Colleges. Child care leave provided under the Sixth Pay Commission is being denied because full time appointments cannot be made against the resultant vacancies. The process of recognition of teachers in the Medical and other Professional Colleges of the University must be streamlined. The University must explore possibilities to generate housing facilities both in the Colleges and University Departments; allotment of University accommodation for teachers must be made transparent; the specific needs of the more vulnerable should to be addressed. In regard to medical benefits, the restricted operation of the direct payment system and the scheme of reimbursing only at CGHS rates are causing substantial hardship since hospital charges are often much higher. A scheme of full reimbursement must be put in place. To help retired members, the University should explore possibilities of crediting the monthly pension to the place of residence of the concerned teacher through e-banking. The enhanced rates for Guest Lectures must be implemented in the NCWEB retrospectively. Urgent steps are called for to immediately to arrest the decline of the School of Open Learning by filling up the vacant positions and creating the basis for improving the distance-learning mode.